I've been thinking for awhile now that I wanted to throw together a wiki for my personal use. Something light-weight that supported uploading images and files - nothing too fancy. And I wanted to self-host it so I have greater control over the data and installation, and can restrict and secure access to it while still accessing it from anywhere. Before you tread this path, there are plenty of nice free/inexpensive tools for notetaking too - Evernote, Confluence, Dropbox Paper, docs.google.com, etc. I guess Facebook just has me wondering in general what the hidden cost of "free" is. If you want a wiki, but you need more than what I've listed, check out WikiMatrix to compare what's out there - just try not to get overwhelmed. For what I wanted it looked like DokuWiki would do the job, so that's what I went with. First, you'll need a place to host your wiki. DokuWiki can be installed on Ubuntu, so we'll spin up an Ubuntu virtual machine using DigitalOcean. I've been using DO for years for this blog, and I can't recommend them enough. Creating new VMs is painless, backing them up and restoring them is easy, they respond quickly, and their documentation is superb. Create a new DigitalOcean account. They call their virtual machines "droplets", so click the big green "Create" button near the top, then choose "Droplets" and "Ubuntu". I chose Ubuntu 17.10. There are other versions available, but you might as well choose the most recent. Select the smallest droplet size. You can always upgrade later, but it should work just fine for DokuWiki and a few users. Choose whatever data center is closest to where you live. Under "additional options" consider selecting "backups". You don't need to do this, but for a whopping $1 a month you gain the ability to roll back your entire droplet if anything gets messed up with it (such as an update gone bad). Give the droplet a name if you'd like, then click "create" at the bottom. After a minute or so, the droplet is created and you get an email with the root password for logging in. The email you receive from DigitalOcean has everything you need to login to your new machine. 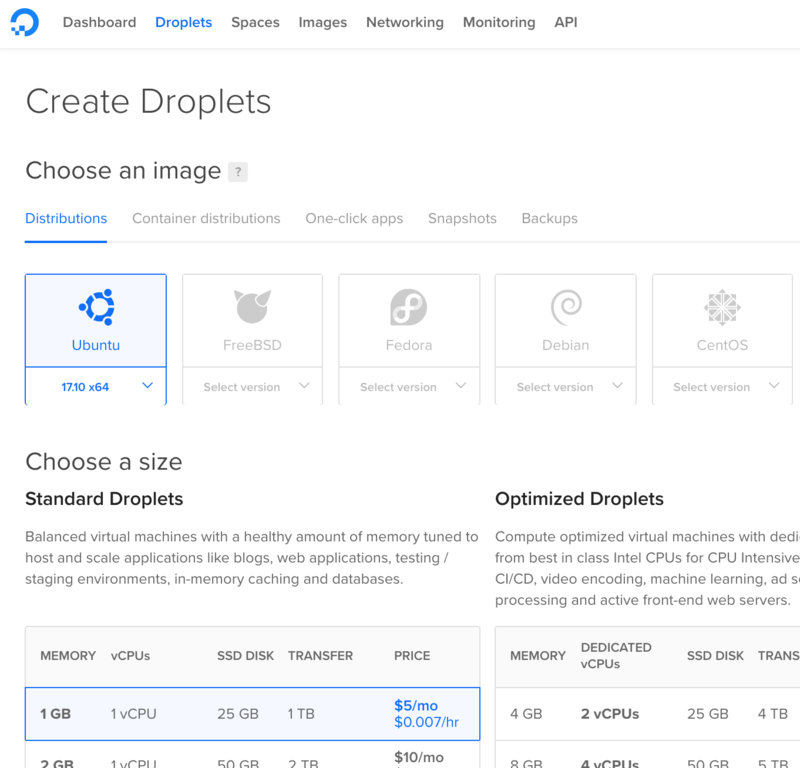 Your new Droplet is all set to go! Open up the terminal window or command prompt of your choice, and type something like this, replacing the IP address with whatever DO assigned to you. It'll prompt you for the password, then make you change it. Create a new user with sudo privileges, so you're not performing everything that follows as root. That's just good practice. Ignore a, b, and c, since you're not doing this for testing purposes. If you don't care about how long the SSL certificate lives, you could change the -days parameter to something longer like 36500 (a hundred years). You'll be prompted for some info. The "Common Name" is the IP address of your new droplet, and you need that. Everything else is optional and you can just click Enter through them. Also, you can just ignore the suggested change to "BrowserMatch" unless you're planning on using IE 6 to access your wiki. After allowing 'Apache Full' in the firewall, I was done. There was no separate 'Apache' entry to delete. You probably won't have one either. 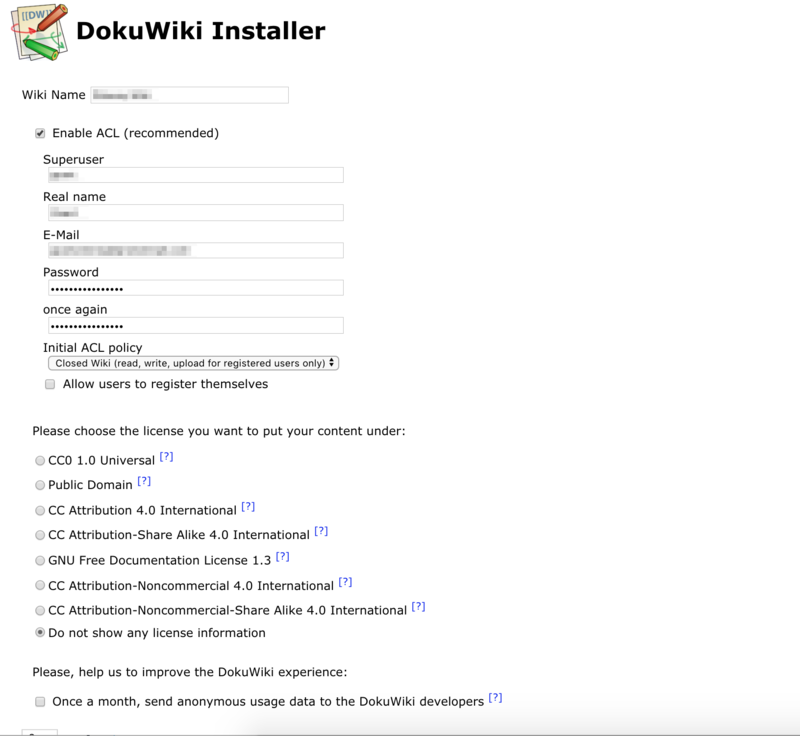 After following the rest of the document, refresh the DokuWiki install page from earlier (or reopen it). It should redirect you from the secure (https) version of the site, and (in most browsers) throw up a nice big red warning page. Just bypass it using whatever method your browser gives you. 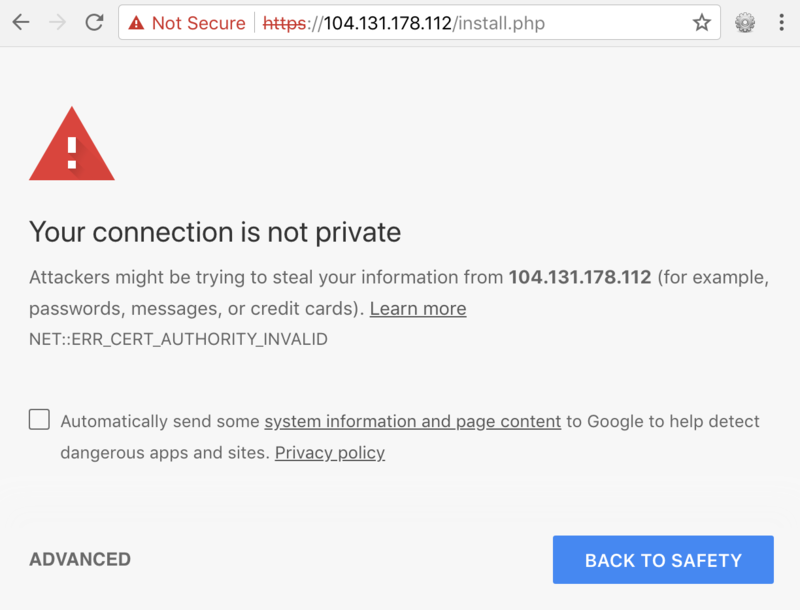 That's the downside of a self-signed certificate, and why you should never use one for a production site. Your communication with the server is encrypted though, so let's continue with setting up the wiki. 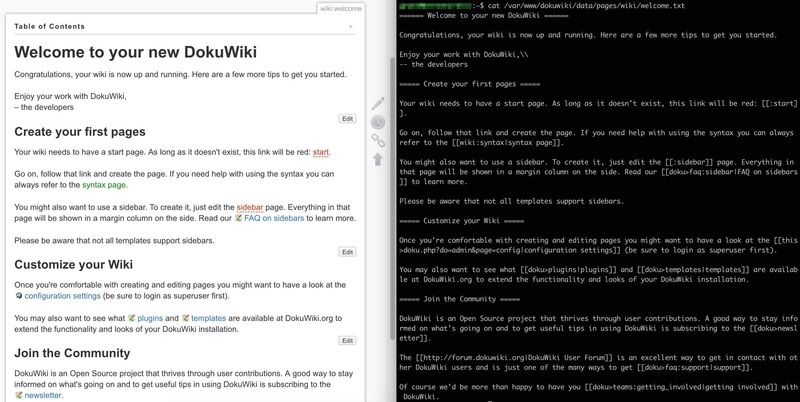 Now that the line to the server is encrypted, let's continue setting up DokuWiki. We'll be setting up a password and other information, and I didn't want to send that in plaintext. Here's how I recommend configuring your installation, but you may want something different. Click "Enable ACL" to setup the initial user, which you can then use to login and change other options. I also chose to disable sending anonymous usage data because I tend to be a tad paranoid about exactly what data is being sent, but ymmv. I didn't bother setting up postfix for sending email because I don't plan on giving anyone else access. If I do run through it, I'll update these instructions. If you're interested in trying it, this tutorial for using Gmail looks pretty comprehensive. There's a lot more you can configure too. Here are a few other things you might consider adjusting. If you truly want a private wiki that no one else can register an account for, or view details about, you'll want to set some other configuration settings. For example, even if you're not logged in you can view the sitemap for the wiki... that lets anyone view the list of pages available (although not the actual content). Login, go to Admin / Configuration Settings and look for the following panel. I'd suggest disabling the following options, but you may want to experiment on your own and see how it affects the site when you're logged out. If you try to upload a file to your new wiki, you'll see something like this. Notice the 2MB limit on uploads. If you were setting up a server for a bunch of people to use, this might be reasonable; however, if it's for you then you might want to upload much larger files. Open the file and look for upload_max_filesize. Change the "2M" to whatever you want, like "100M". Now you'll be able to upload 100 MB files. Apparently you have to modify one more setting, and that's to make post_max_size greater than upload_max_filesize. Better yet, the comments in the file suggest setting it to 0 to just disable, which works fine for me. Maybe not a great idea for a public facing blog with lots of users, but if it's just for you then I wouldn't sweat it. Restart your server with sudo service apache2 restart and try uploading again. I use markdown all over - on my blog, Stack Overflow, GitHub, etc. If you'd like to add support for it to DokuWiki, click on the "Admin" link and go to "Extension Manager". From there, do a search for "markdown". As of this writing, markdowku appears to be the most recently maintained plugin. Click the "Install" link next to it and try it out - it seems to be working for me. I already have a free certificate from Let's Encrypt for my blog. If you do too, you might consider configuring wildcard certificates so you can assign your wiki to something like "wiki.your-blog-domain.com". I haven't gone through this yet, so no clue how simple or complicated it'll be. That's it! 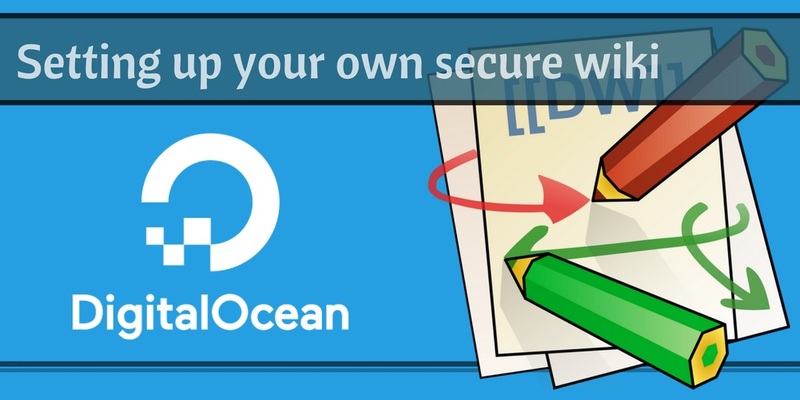 You have a personal, secure environment to store 25 GB worth of notes, images, files, etc - for only $5 a month. If you end up needing more space, you can easily add extra through the DigitalOcean admin panel. If you manage to get it working, let me know... I'd love to hear how it goes. Good luck!